Ben 10, Alien Force fans have been able to create their own Ben 10 cartoons via Cartoon Network Asia's GoAnimate powered Toon Creator for some time now. (Note that if you're a fan of the cartoon Chowder you can also make Chowder cartoons too). If you've used GoAnimate's Studio (or even DomoAnimate's Studio) then you'll be right at home in Toon Creator. Everything is virtually the same and you'll have no trouble finding your way around. 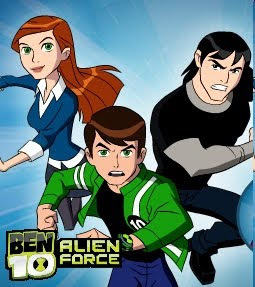 I'm not that familiar with the characters of Ben 10 Alien Force but with a bit of research I discovered that Ben (in the green jacket) is the groups leader and has the ability to change into various powerful aliens through a watch like device known as the Omnitrix. Gwen is Ben's Cousin who has the power to manipulate natural energy - not sure how she got these powers though? Kevin (in black) is a former nemesis of Ben who has reformed. Half alien and half human Kevin can turn his body into any solid substance he touches. He also has a secret crush on Gwen. Like it? Create your own at Toon Creator. It's free and fun! Ordinarily I'd give you some behind the scenes information about my animations but with this there's really not much left to tell. Instead I'll give you my thoughts on Cartoon Network's Toon Creator. It's important to note that Toon Creator is firmly targeted at kids in their early teens and younger. Unfortunately because of that it's heavily monitored and controlled almost to the point of stifling creativity. Your cartoons will be checked for appropriateness before going public. Strangly enough on Toon Creator the 'fart' joke is inappropriate (as I discovered on my second animation, Something in the Air below. See the original version here. Yet on DomoAnimate (also targeted at the same age groups) farts are a key part of Domo's character. I can certainly understand the need for keeping the content 'kid safe' but in order to do it, just like DomoAnimate, the site won't let you upload custom anything. Top that off with no audio samples being provided from the actual Ben 10 Alien Force cartoons and no other themes you can mix with Ben 10 and Toon Creator is very limiting indeed. On the flip side, being so limited does encourage users to be really creative with the props and backgrounds they have. Often people will use props in really unexpected ways. Unfortunately the sound effects and music available to use in your animation aren't quite so flexible in finding creative alternative uses. You either have to settle for lame sound effects or just make the best of what you can with a music track. You'll notice in my third animation, Time, below the same lame crashing sound that I used in Ben Makes Dinner for an explosion noise. My final comment about the site is... why oh why can you not comment on animations or user profiles like you can with GoAnimate? It's enormously difficult to connect with other people who use Toon Creator however if you find your way to the Toon Creator Forum, you'll find a pretty healthy community. I just don't understand. If they have a forum, why can't they allow you to comment on animation and user profile pages? All up, you'd have to be a die hard Ben 10 Alien Force (or Chowder) fan to stick with Toon Creator. It's the only place you can make your own cartoons with those themes. However if you're just interested in mixing things up and making a wide range of animations with many themes - including your own custom work - GoAnimate would probably suit you better. What an exhaustive review of the Toon Creator! Great post TET. You still managed to create pretty funny animations despite the limitations. We will hopefully continue to grow the content in the Ben 10 Alien Force and Chowder themes as we go. It should get more interesting Still, of course we understand the limitation not being able to upload anything. It's for kids. So it takes a safe approach. I started with Ben 10 because the characters are quite different to anything on GoAnimate but I will be trying out the Chowder theme soon too, Nicolas. I'm disappointed to learn that Toon Creator is so region specific that people outside the Asia Pacific region can't even watch my embeded videos above. I'm aware that's probably due to regional licensing agreements but it's disappointing and will probably mean I don't stick with the site until it becomes much more world wide access. Nice! This is a nice Toon Creator! But, I reached the site and it's closed.>:( Isn't it nice? It appears to have closed very recently for reasons I don't know why. They certainly didn't send any kind of message out to members (or if they did I never received it).